A ruby-throated hummingbird sits on her nest, which is well camouflaged with bits of lichen and sheltered by maple leaves above. It’s always a treat to see a hummingbird zoom up to a hummingbird feeder or hover at a garden flower. These tiny birds seem like fleeting, exotic gifts from the tropics. But they also live in our local woods and even breed there, like so many of the birds that come to Westborough and neighboring towns for the spring and summer. With luck, you might glimpse one there, doing ordinary things that other birds do, like perching quietly on a bare branch or feeding young in a nest. For all of us who live in states east of the Mississippi River, the hummingbird that we see is the ruby-throated hummingbird (Archilochus colubris). These amazingly quick creatures – so tiny that you might mistake one for a dragonfly – have jewel-like iridescent colors that shimmer when the light catches them just right. Their bodies are green, and males have a red throat patch that flashes in the sun (but may look black otherwise). The hummingbird lifestyle is a solitary one. These tiny, feisty birds are aggressive toward one another, as you might notice if more than one hummingbird shows up at a feeder. Males and females stake out and defend their own separate territories containing good food sources – flowers with nectar and trees with oozing sap for sugar, and plenty of small insects such as mosquitos, gnats, small bees, small caterpillars, and spiders to provide protein. In the case of females, a territory should also include good nesting sites. 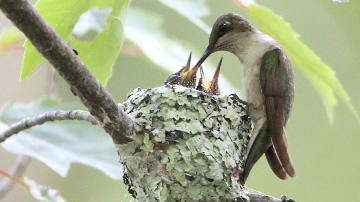 A female ruby-throated hummingbird feeds her two chicks. Note than only males have the characteristics ruby-red throat. Males and females don’t pair up the way so many other birds do. Instead, they find one another for a brief courtship involving a fancy U-shaped flight display by the male and a brief mating encounter. Then the two go their separate ways. The male goes on to court other females. The female finishes building a nest she has probably already started, lays two bean-sized (half-inch) white eggs, sits on the nest, and feeds and cares for the chicks all on her own. 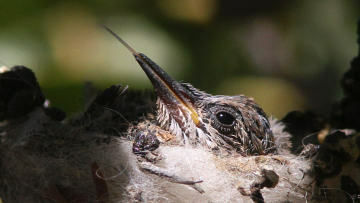 A hummingbird nest is about as tiny as you might expect – an inch deep and two inches wide. Think of it as about the size of a walnut shell. It’s held together with spider silk – stolen from spider webs – so it’s both strong and stretchy and can expand as the two hummingbird chicks grow. Inside, it’s soft with down from plants such as ferns, dandelions, and thistles. On the outside, it’s well camouflaged with bits of lichen and moss. The nest is in use for a little more than a month. A female ruby-throat incubates her eggs for about 12-14 days, and then the two chicks hatch and grow rapidly for 18-22 days. They start out about the size of bumblebees and grow to the size of their mother, or slightly larger, in that time. 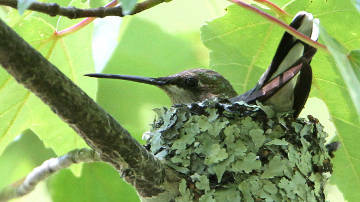 (For a wonderful online set of day-by-day photos showing hummingbird chicks from egg to fledgling, go to http://www.learner.org/jnorth/tm/humm/NestWeeklyCQs.html .) She continues to feed them for about a week after they leave the nest. What’s this miracle food that she gives them? Its composition changes over time, but it starts off as fluid from her crop, which is a pouch in her throat that stores and softens food she has eaten – insects and nectar. She squirts it down the chicks’ throats using her slim beak and her long grooved tongue, which she can stick out far beyond the end of her beak. Later, she might pass whole insects to chicks as they get to be adult-sized. A hummingbird chick in the nest sticks out its tongue. After breeding, the ruby-throated hummingbirds that arrived in our area or passed through it (back in late April and May) will depart in late August and September. Watch for them then. They’ll head for southern Mexico and Central America for the winter. For as long as they can, they travel over land, taking energy drinks of nectar along the way. Among their favorite summer flowers are spotted jewelweed (Impatiens capensis), cardinal flower (Lobelia cardinalis), trumpet creeper (Campsis radicans), wild bergamot (Monarda fistulosa), bee-balm (Monarda didyma), and many more. It has been suggested that they follow the blossoming jewelweed south. Then they fatten up for a week and many of them make an arduous 600-mile nonstop flight across the Gulf of Mexico, flying just above the waves. Some others may make a longer journey over land, along the coast of Mexico. Hummingbirds are native to North and South America, with 18 species in North America and more than 300 species in South America. Different hummingbirds live in meadows, rain forests, and deserts. We have only one, and it likes our woods, so let’s enjoy ruby-throated hummingbirds while they’re here.